Structural integrity refers to the ability of the piece of furniture to function as designed. A chair should be stable enough to be sat upon; a chest with drawers should have drawers that slide in and out. With the majority of damage to fine furniture being from water, U.V light, humidity damage, and being knocking around, the structural elements that usually need attention are joints, corners, veneers, and other design elements that were attached using glues. A piece of fine furniture can be seriously devalued if structural repair is carried out with materials not appropriate to those available during the period of its making. 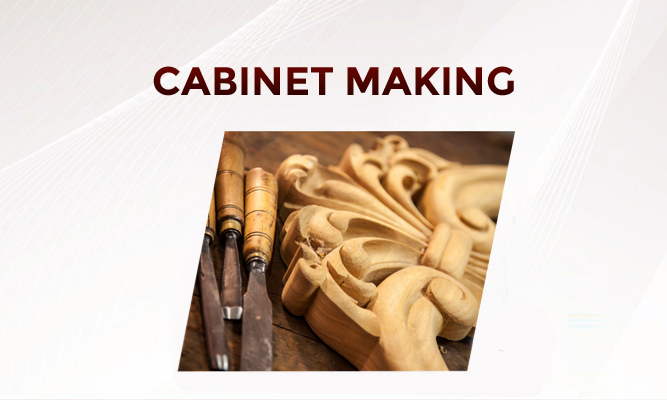 When a piece does not have significant monetary value, and it needs restoration for structural integrity and aesthetics, fine craftsmen will still repair and restore the furniture using materials that match as closely as possible the originals. There have been some improvements in glues and wood-polymer materials, but newer materials are used only when those close to the originals are not available or appropriate to the piece. Wood Carving s a form of woodworking by means of a cutting tool in one hand or a chisel by two hands or with one hand on a chisel and one hand on a mallet, resulting in a wooden figure or wooden object. Carved decoration is often used on antique furniture, and is one of the first things to get damaged. 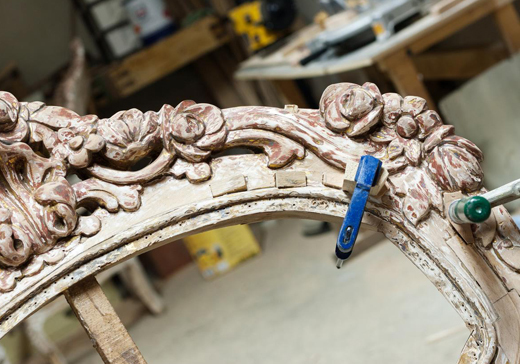 At Benchmark Restorations We can replace missing decoration to bring your piece back to life.If nothing is available to copy, a little research usually provides models or examples to follow. Woodturning is the craft of using the wood lathe with hand-held tools to cut a shape that is symmetrical around the axis of rotation. Items made on the lathe include tool handles, legs, spindles and pegs for furniture; balusters and newel posts for architecture; hollow forms such as urns or sculptures; bowls, platters, and chair seats. At Benchmark Restorations we can reproduce most styles of turnings using ttraditional materials and techniques, with a selection of quality period timbers.If nothing is available to copy, a little research usually provides models or examples to follow. Marquetry is the art and craft of applying pieces of veneer to a structure to form decorative patterns, designs or pictures. Parquetry is a technique very similar to marquetry that utilizes pieces of veneer in simple repeating geometric shapes to form tiled patterns such as would cover a floor or forming basket weave or brickwork patterns, trelliswork and the like.At Benchmark Restorations Sydney we can repair damage to your treasured items using these traditional techniques and materials. At Benchmark Restoration we can add additional leaves to dining tables, raise table height to accommodate taller individuals or higher chairs.Headboards and footboards can be enlarged from queen to king size with appropriate and sensitive detailing.Nearly all traditionally made furniture can be re-constructed – Wardrobes into bookshelves or TV cabinets, shorten or lengthen tables etc. You have done an amazing job on the sideboard!You have restored it beautifully & the mirror looks perfect at its new size in the entrance way!Beautiful craftsmanship, thank you! Just a quick message to let you know how happy we are with all the work that you did for us. In particular, the chest of drawers....it has made ourselves and our family so happy to see a family heirloom returned to its former glory. Your work has exceeded what we thought could be achieved. Hi, Gideon. Just wanted to say how thrilled we are with the table and chairs. They came up even more beautifully than we'd hoped. Thanks so much! Wow, what a transformation, Liz and I believe that the table and chairs look better now than they did when we brought them.Thank you so much for all of your hard work. We are easily accessible in Leichhardt, only 20 minutes from the Sydney CBD. We service all Sydney metropolitan and North shore areas.